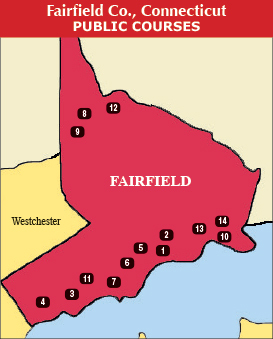 The state of Connecticut is flush with great golf courses, and in this section, Golf Guides USA is detailing the one county in our coverage range, Fairfield County. Although the wealthy county is ripe with great, and historic, private golf courses, there are also a good number of wonderful public tracks to satisfy the imminent golfing desires. Whether you're traveling to Fairfield County, or you live there, our guide will give you all you need to know about the area, and will lead you to the best golf courses that the county has to offer.